Add a classy and sophisticated look to items by gilding them with gold leaf. 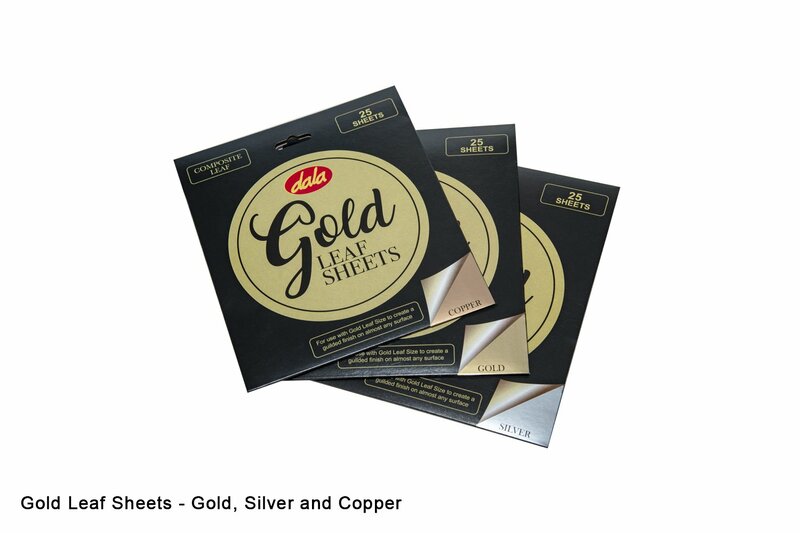 Gold leaf is an extremely thin and lightweight foil sheet product used for the gilding of picture frames, adding an antique look to crockery, pottery, jewellery, bric-a-brac and more! Use in conjunction with a dala Gold leaf Size and Dala Gold Leaf varnish. Gold leaf can be used on almost any surface, including glass, plastic, wood, pottery, ceramics, metal and more! It is however advised that rough surfaces be made smooth and non-porous before application. 1. Prepare your surface by making sure it is dust free and dry. 2. Apply the sizing (gold leaf adhesive) to an area on your chosen object. This can be done free hand but will also work well with any stencils you may want to use. Blocking off areas and creating patterns with washi tape or masking tape also works really well. 3. Leave the siziing on the surface for 20-30 minutes to become tacky before applying any of the gold leaf. 4. Once the sizing is ready (test the area by touching it with your knuckle - if it is ready the sizing will not stick and come off on your hand) place the sheet of gold leaf onto the tacky area and apply gentle pressure. Allow the gold leaf to sit on the adhesive for a few minutes. Once all areas, including any small detailed areas or corners are also covered fully by the gold leaf you can burnish the leaf gently using a soft cloth over your fingers or a soft thick brush. If you are applying gold leaf to a small area the excess gold leaf can be peeled off carefully and saved for other applications. When applying gold leaf to larger areas the excess gold leaf can be rubbed off and used to full in small gaps or holes, or it can be rubbed off and discarded completely. However, with gold leaf the saying waste not - want not applies! 5. If there are by chance any areas that you may have missed you can carefully apply some small pieces of gold leaf to fill in the areas and create a seamless join. Alternatively, the leaf can be applied imperfectly to create an antiqued creased and crackled effect. 6. Seal your piece by painting over the area that you have applied the leaf to. This will minimize any scratches or damage to the guilded area. Use in conjunction with any of our sealant products such as Dala Acrylic Gloss Glaze or Artists Clear Varnish and leave to cure fully for 24 hours. This item has 2445 views.